weight loss after pregnancy foods. weight loss after pregnancy tips. Weight loss after pregnancy is essential to reduce the risk of developing diabetes and cardiovascular disease later in life. In fact, women who become overweight during pregnancy and are unable to shed off excess fat within a period of six months after the delivery, have an elevated risk of becoming obese a decade later. When Should The Postpartum Weight Loss Program Be Started? Once the baby has been delivered, the top priority for most of the mothers is to get back their pre-pregnancy shape and get into their old clothes. However, one should not start a weight loss program immediately after pregnancy. Since the baby is breastfeeding, you cannot compromise on your food intake by cutting down on your diet, nor can you immediately start off on rigorous exercise. The weight loss program must begin in a slow and phased manner – simple exercises initially, followed by rigorous work-outs much later, once the baby is weaned. Adequate nutrition is essential all along, and cannot be compromised at any time. It’s preferable to start a weight loss program only after 6 weeks. Those who have had a caesarean section must wait until 8 weeks till they have recovered from the surgery to embark upon a weight loss program. The pattern of weight loss after pregnancy varies with each mother but the greatest amount of weight loss occurs in the first 3 months postpartum and then continues at a slow and steady rate until 6 months postpartum. It’s common to put on or retain the pregnancy weight. Disheartenment and guilt at not being able to lose weight is common. But, where it took 9 months to gain weight, it is natural that another 9 months would be needed to lose it. Patience therefore is the key to keep going! 1. Walking : It is a fun and easiest way to be fit. Going outdoors in places like parks will rejuvenate you with fresh air. If it is not possible to go out for a walk you can walk for 5 mins every one hour at home. 2. Exercise: is an another great way to lose weight. You can join Gym and perform cardio and weight bearing exercises to tone your muscles. It also strengthens bones and prevents osteoporosis. 3. Swimming: This is an amazing cardiovascular exercise which helps in building stamina. 4. Yoga: Some may prefer to join classes. while some learn yoga and do it at home. It will not only help in maintaining good physical health but also mental health. 5. Workout Time: It is ideal to workout twice daily. Once in the morning and once in evening. Or you may atleast walk for 30 mins twice a day to lead a healthy life. 6. Keep yourself hydrated: Drink plenty of water throughtout the day and in between short bouts of exercise. 7. Meals: Have small frequent meals. This will keep you satiated throughout the day. Make sure to include healthy snacks and foods. Avoid keeping unhealthy jar snacks at home like farsan, biscuits and choose healthier options like whole wheat khakhras and steamed snacks like dal pandoli and healthy muthias. 8. Variety in your diet: Have a variety of foods in your diet. Make your plate colourful with different types of vegetables and fruits everyday. 9. Fibre: Increase your fibre intake by eating fibre rich foods like vegetables, fruits, whole grain products, oats etc. 10. Avoid Junk: Ignore all the fatty foods, fried foods. they provide unnecessary amount of calories and promote weight gain. 11. Whole fruits: It is a misconception that juices help to reduce weight. Whole fruits are better than juices because they have fibre, makes you feel full in small quantity, there is no added sugar and chewing takes time so that you eat less. While making juices requires at least 2-3 fruits and also lacks fibre which simply increaes the calorie intake. 12. Try different food styles: Try variation in methods of cooking food. Steaming, boiling, roasting, grilling, stir frying are better methods of cooking. 13. Cookware: Use non-stick cookware so that you have to use less amount of oil in cooking. 14. Eat slowly: Have patients and chew your food well. It gives your brain a chance to send 'feeling full' signal to your stomach and refrains you from over eating. 15. Balanced Meal: Have a balanced meal. Include cereals,pulses, dairy products, vegetables and fruits in your daily diet. Use oil and sugar sparingly. Make sure to eat proteins in your main meals in the form of dals, eggs, beans and sprouts. Palak Methi Muthia represents perfection in flavour, nutrition and visual appeal. The flavours of spinach and fenugreek balance each other very well in these steamed iron and folic acid rich dumplings. Khakhras have been one of the healthiest snacks since they are easy to store. Make these Whole Wheat and Methi Khakhras which are iron rich but low in calcium and great snack option if you want to lose weight. Dal Pandoli is a low calorie healthier version of traditional Gujarati pandoli as it is made from chola dal and palak where chola dal adds nutrients like protein, calcium, iron and folic acid and palak adds vitamin A.
Ragi has a very balanced set of nutrients, and if prepared well it is very tasty too! Nachni and Onion Roti is an intelligent way of incorporating ragi in your diet in a way that appeals to all and adds on to the nutrition value of your diet. Pumpkin is a wonder vegetable – but sadly, its health benefits are not known to many. Red pumpkin contains a horde of valuable nutrients like fiber, folic acid and vitamin A, while also being low in calories. Thus being great for weight loss you should consume it as a subzi like Pumpkin Dry Vegetable. Panchmel Dal is a wholesome combo of five dals is flavoured with a special masala water and whole spices as well! Not only the flavours of the spices, but the flavours of the assorted dals are also discernable in this delightful dish. Have it with your favourite roti or paratha to enhance its protein value. 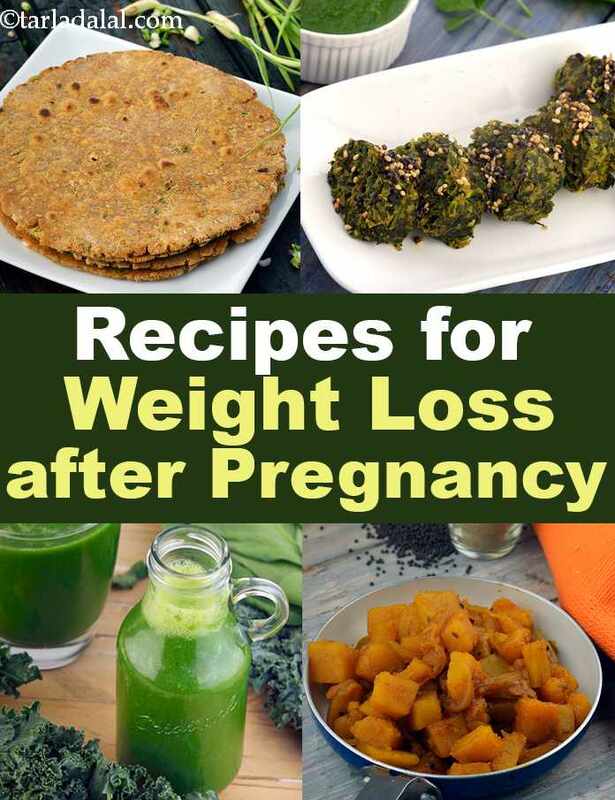 Enjoy our range of recipes recipes for weight loss after pregnancy and check out our other pregnancy recipe categories. Subzi kadhi, in my variation of the gujarati kadhi, veggies add loads of vitamins, while the low amount of ghee keeps the calorie count down. Having it with khichdi or steaming hot rice makes this a complete meal. Avoid sour curds which may not suit the new mother. Fruity sprouts salad, rich in beneficial ingredients – papaya aids digestion, curds boost the immune system and improve skin texture. Very satiating, specially when you are on diet and restrict your food intake. It’s all in the dressing is all i can say about this crunchy and sweet salad! Healthy sheera is loaded with nutrients - whole wheat flour, nachani and soya are three flours that are protein rich, while almonds and jaggery add iron. Since i have used only 2 tsp ghee, it is definitely guilt-free. Remember to use a non-stick pan to avoid sticking. Delicately seasoned with simple spices, this is one dish that you will relish. I have added only 1 tsp of coconut to bring down the calories, making this a sumptuous, healthy breakfast when compared to the coconut laden south indian original.